I don’t know how to begin to explain this. To those who think ghosts or spirits don’t exist, all I can say is if you are EVER in a place known to be haunted, SHOW RESPECT! My story starts out when my brother arrived last Wednesday night to visit me for my Birthday. He’s a Paranormal Fan and I myself get pleasure out of watching Zak, Aaron and Nick (Ghost Adventures) trying to document Ghosts. I can say a Ghost documented me. 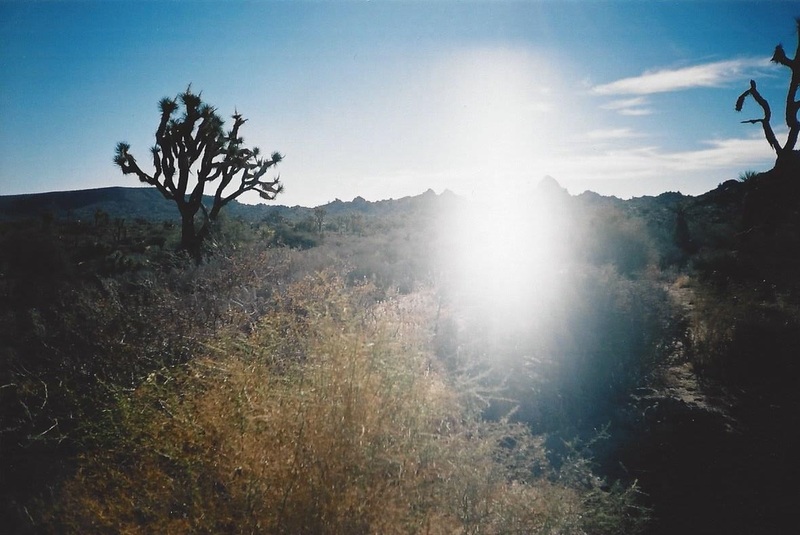 Stick with me, it’s an incredible yet enigmatic story that isn’t even 24 hours old yet. It was my bright Idea to drive to Virginia City in the State of Nevada. That’s where the Ghost Adventure Crew shot their documentary and caught a full body apparition on film. Where did they catch it? The Old Washoe Club in Virginia City NV. It was so legit that channel 4 from Reno NV sent a crew with Zak on his 2nd trip and NBC cameras caught a brick being thrown. And of course the debunkers were debunked by cinematic forensic investigators. In other words, they said the film was legit. But with stuff like this, you’ll always have doubt until it happens to you. Regardless of whether we saw a ghost or had “an experience”; I thought it would be a nice drive up to the old mining town. Virginia city is not easy to find. To make matters worse, if you’re from California or any other state that spends lots of money on infrastructure; you’ll hate the lack of directional signs. So just getting to Va. City was a challenge. Now let me say that I’ve been told that I’m “Clairsentient”. Unlike a Clairvoyant who can see the future, I get a feeling when something is going to happen. I think we all have it, but some of us are just more “Full of it”. I first noticed my gift in October of 1989. I looked out a huge window and said: “Looks like Earthquake weather”. At 5:17PM, The Loma Prietta Earthquake leveled much of the San Francisco Bay Area. I just felt it in my gut. Many call it a “Gut Feeling”. I pay attention to mine. 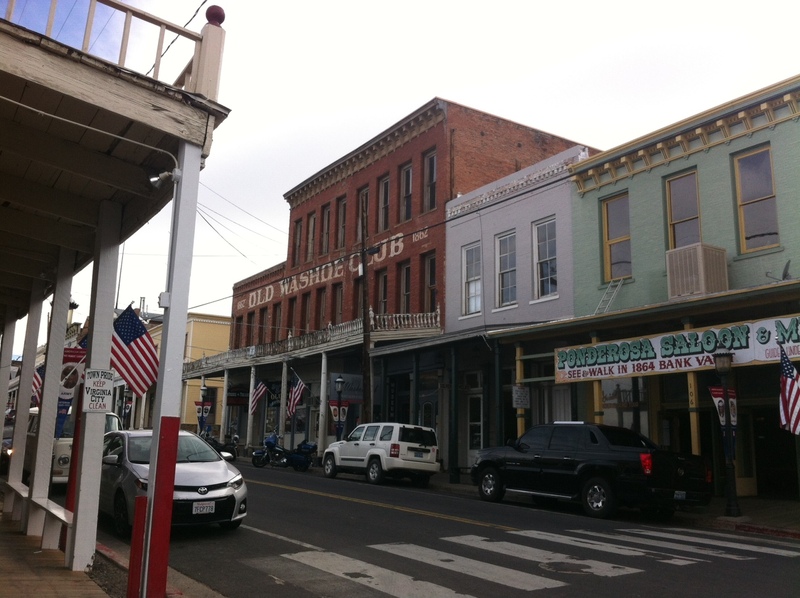 On the way to the Washoe Club, my stomach started getting sick. And NO I’ve never gotten motion sickness before. I use to ride a destroyer in the Navy. I was in the wake of Typhoon Pamela on a Westpac tour. I never got motion sickness. So I know it wasn’t the car ride. Besides, I was driving. 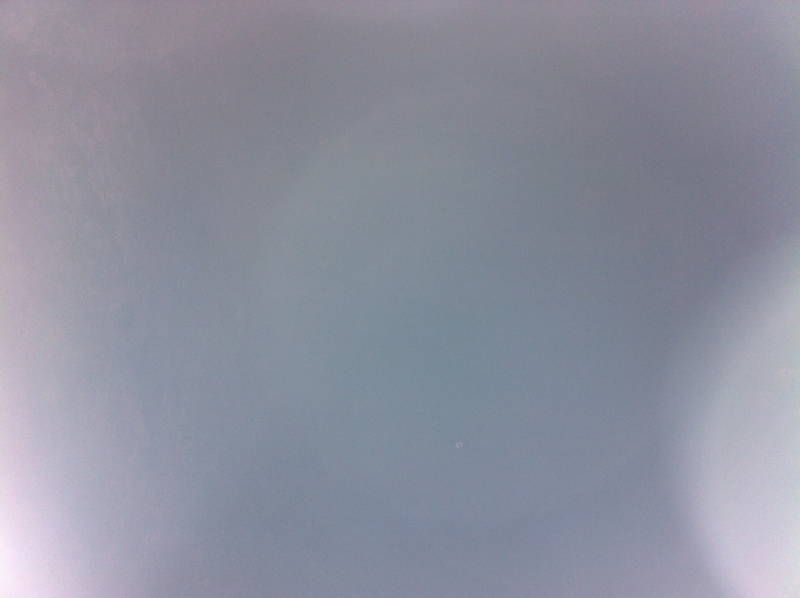 This is the first Ghost I ever took a picture of. So we get to Virginia City and find a parking space. 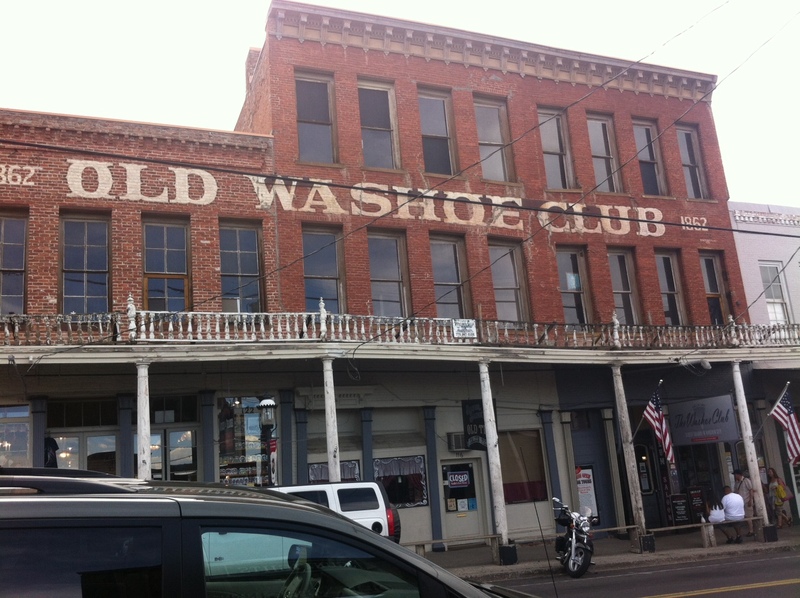 We go right to the “Old Washoe Club”. It’s not hard to find. We went inside and I was quite disappointed because they have a banner that hangs outside that says: “As seen on Ghost Adventures”. I felt that really detracted from the authenticity of the establishment. So I got an attitude about this place. I thought it was more of a carnival than a real haunted site. When you walk in, it has a list of “Tours” you can take, of course a T-shirt shop, but a good old Bar up front. There was a guy there that looked like me. (Long black hair) And I said, so what’s this place all about? He said well this is where Zak and Ghost adventures all started. He said you can take the tour upstairs for 8 bucks or just order a drink and you can go in the back where the Morgue or “Crypt” is. The Crypt is a place where they use to stack dead bodies during the snow. It’s reportedly quite HAUNTED! So I bought a bottled water and drinks for my party of 5 and we proceeded to the back of the parlor. As we went into the back, a tour of about 15 people were coming out of the Morgue giggling and mocking the spirits, then checking their cell phones to see if they got any “ORBS” or apparitions. I thought it was a joke. Shortly after they vacated the Morgue I went in with my 4 family members. It was suddenly cold and eerie. 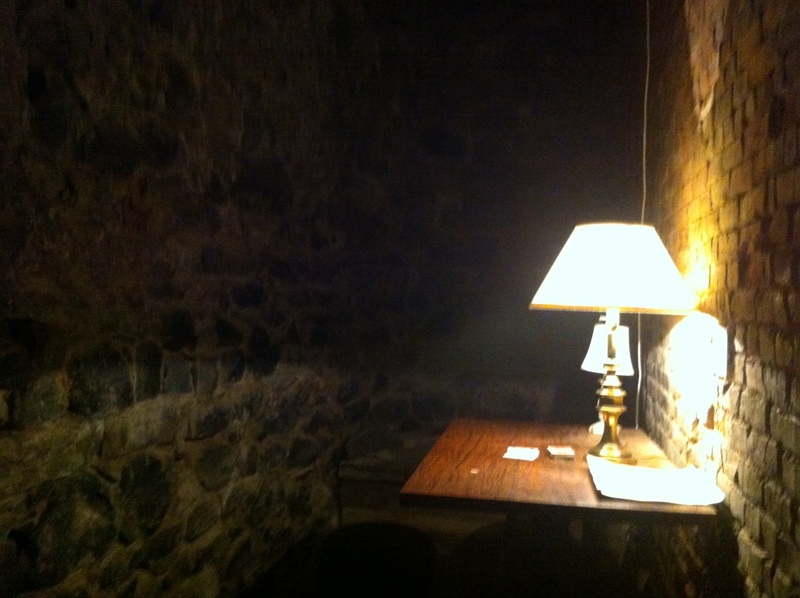 The room was made of Rocks and there was a small table with a lamp and a stack of cards on it. The lamp lit up the room. So we did the camera thing and my brother was trying to use the “Law of Attraction to summon a spirit”. We were all pretty underwhelmed. We said “Meh” and left the Crypt. As I was walking out, a lady came out of nowhere and said to me: “Have you been in there with the lights out? Alone? I said, “Uh NO”! She said try it. So I thought, what the hell, I’ll play. So I went back into the morgue after I got my cell phone camera ready; and I reached for the lamp and turned out the light. I backed up so I could get some panoramic shots of the Crypt. 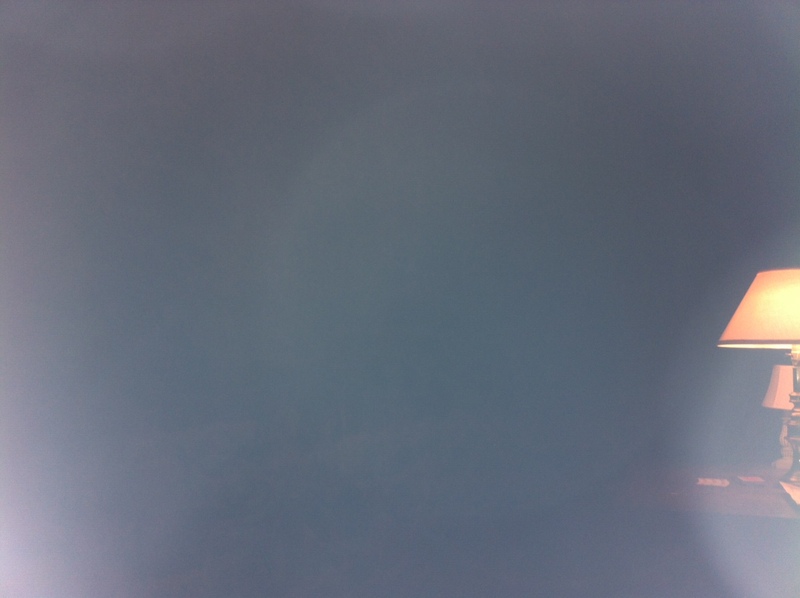 I took two pictures and I heard two low frequency rumbling sounds. I will admit, I was really scared and exited the crypt. It sounded like the vibration was right next to me. But still being skeptical, I went back in and continued to shoot in the dark. I went back to the Bar and asked one of the staff, what’s that low rumbling sound? Are there hot water pipes or toilet pipes that run along the back wall? They said, there’s nothing back there except the fire sprinklers and they’re above you and if they move, you’re going to be sprinkled on. So the staff was curious and went back with me. When we were out of the Washoe Club, I looked down at my Tags and my tag that was on my small chain was tampered with. The silencer had been taken off. I must add that in addition to the 2nd tag, I also wear a crucifix. (A Christian Cross). 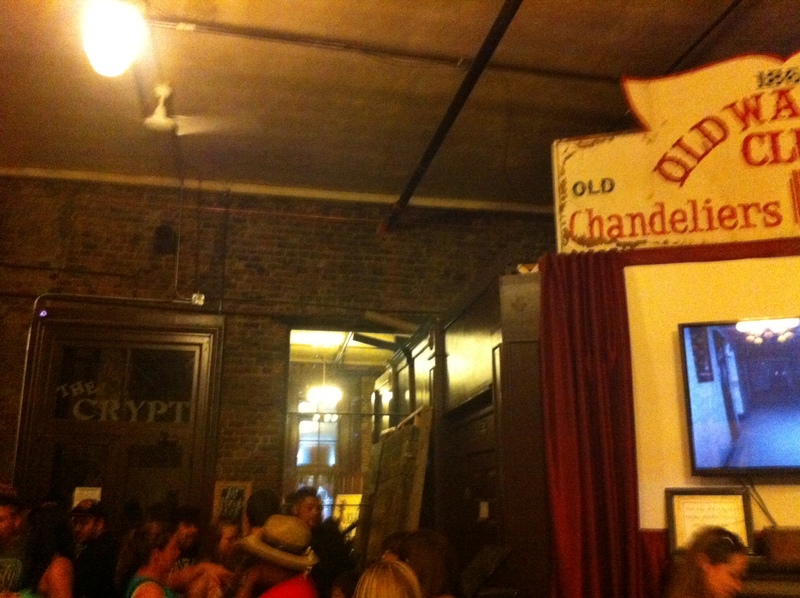 So my tags being messed with was the only thing that was unusual about the trip to the Haunted Old Washoe Club. Before bed, I hung my tags up on a hook on the wall and I took my shirt off before calling it a night. 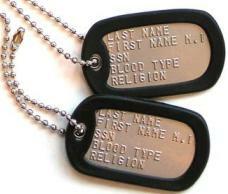 Remember, I wear my dog tags on the OUTSIDE of my shirt. (No skin contact) When I looked down at the area where my dog tags were, I saw a scratch. I thought it might have been a bug bite from the mountains. 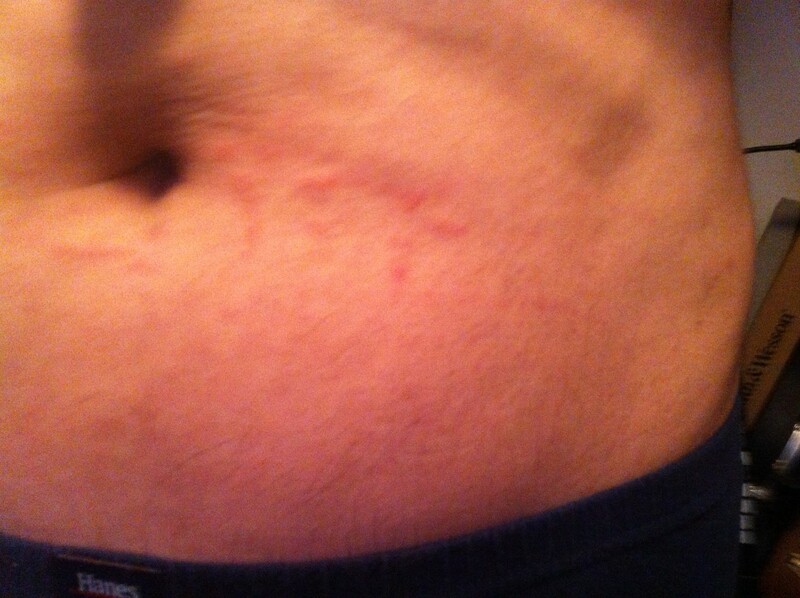 So I looked at it in the bathroom and it looked like lines that had been scratched into my skin around my abdomen. I said “Meh” and put some Cortisone ointment on it and didn’t think anything of it. (Even though it was in the same area that my dog tags were hanging) This morning when I woke up (And as I’m writing this 21 hours later) the scratches were still there in spite of the Steroid cream. So I took a picture of it. Apparently an upset spirit or ghost named “TEX” wrote his name on my stomach. Click on the image to see the Ghost’s autograph. And NO IT’S NOT PHOTO SHOPPED!